Restore the king to his rightful throne, defeat his oldest enemies, and unite Malay’s people under the leadership of the wise Gajah Mada. 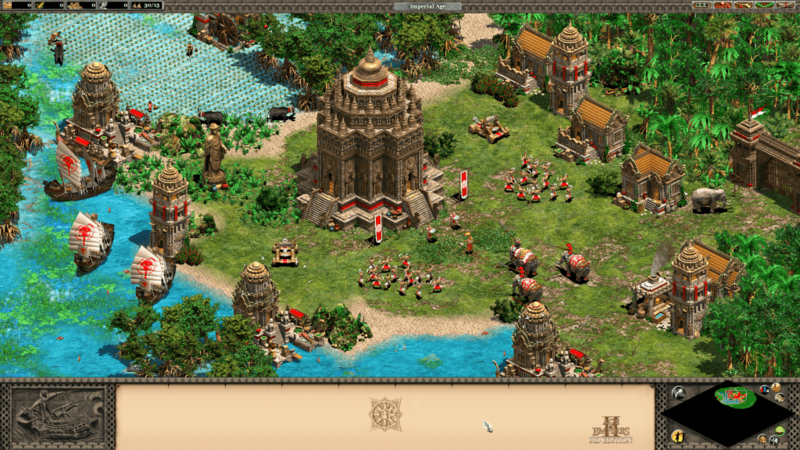 Conquer Southeast Asia with the vast island empire of Malay and upgrade your docks to harbors which can shoot arrows. The Malay unique unit is the Karambit Warrior, an extremely cheap infantry unit that can quickly overwhelm its foes. One of the first states to dominate the archipelago was Srivijaya (671-1377) in Southern Sumatra. To secure their trade with China, the maharajas of Srivijaya conquered several kingdoms in Sumatra, the Malaysian peninsula, and Java. Naval expeditions even ventured up the Mekong river in mainland Southeast Asia, but the emergence of the powerful Khmer Empire prevented a long-lasting presence. As an international center for Buddhism and education, the capital of Palembang attracted many pilgrims and scholars from all over Asia. Although the maharajas did not erect many temples themselves, their vassals in Java constructed some of the largest Buddhist monuments in the world, such as Borobudur and Sewu. Despite these economic and cultural achievements, the Srivijaya empire gradually disintegrated under the pressure of Indian raids and Javanese conquests beginning in the eleventh century. After Srivijaya, Javanese kingdoms rose to prominence. One of them, the Majapahit Empire (1293-1527), eventually became one of the most powerful states in Southeast Asia. In 1293, Raden Wijaya founded the empire by allying with the invading Mongol armies to depose his rival, after which he vanquished the Mongols in a surprise attack. Under the military leadership of Gajah Mada (1313-1364), prime minister to two emperors, Majapahit reached its largest extent: from the Malaysian peninsula in the west to New Guinea in the east. During this golden era, arts, literature, and architecture flourished. Puppet theatre and orchestras were developed. A truly Javanese culture emerged through the synthesis of Shiva worship and Tantric Buddhism. In the fifteenth century, internal strife and the emergence of a new trading power called Malacca led to the decline of the Majapahit. In 1398, the Majapahit had invaded Singapura, a small kingdom in the Malaysian peninsula. Their king, Parameswara, fled the state and founded the city of Malacca. Thanks to good relations with the Chinese Ming dynasty, the city attracted merchants and gradually became one of the major ports on the Indo-Chinese trade route. At the end of his reign, King Paramesware converted to Islam, thereby founding the Malacca Sultanate (1414-1511). Although Southeast Asia had come into contact with Islam from an early date via traders, Muslim communities had remained limited. With the territorial expansion of the Sultanate, Malacca became an important center from which Islam spread. Subsequently, the Malay culture, initially inspired by Hinduism and Buddhism, underwent profound cultural changes inspired by their new Islamic faith. Lured by the rich trade of the archipelago, European explorers came to Southeast Asia from the end of the Middle Ages. In 1511, a Portuguese army under Afonso de Albuquerque conquered the port of Malacca, marking the end of the Sultanate. For the next several centuries, European states would dominate the trade in the archipelago.